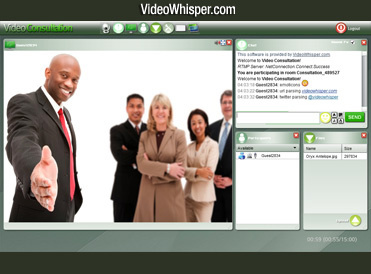 This web based Video Consultation module can easily be installed on Elgg to enable video collaboration. Users are enabled to create unlimited creation of video presentation rooms. This provides live web based video conferencing, chat, live shared slideshows and file exchange features with advanced realtime moderation designed for video seminars, internet based live trainings and e-learning, online collaboration. Download latest Elgg Module zip version and copy the files from the zip file including folder structure to your mod folder in Elgg installation folder. After doing this you should have mod/videoconsultation/start.php in your elgg installation folder. From Elgg administration area, enable the videoconsultation module from Tool Administration. Optionally you can add the Video Consultation Rooms widget to default profile widgets and default dashbord widgets. Fill the RTMP application path in Video Consultation > Settings on site frontend. The Elgg Video Consultation integration is based on a slightly modified php video consultation edition so you can also check that for customizing settings, integration and implementation of other features. You will find most files mentioned there in mod/videoconsultation .